Mechanical drawing image of our newest AUV, REMUS 3000, currently being constructed out of titanium in our laboratory. 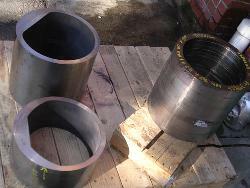 Raw titanium pictured prior to being machined for hull sections for the REMUS 3000 AUV. The REMUS 3000 is similar to the REMUS-600 in vehicle size, however this vehicle, constructed out of titanium, can swim to much deeper depths and it carries a more advanced sensor package for underwater mapping and imaging. Two vehicles are currently being engineered in our lab and will contain dual frequency Edgetech sidescan sonars for high resolution sonar imagery and dual digital camera systems for maximum coverage and mutlidimensional image mapping. The REMUS-3000s will also have inertial navigation systems (Kearfott T-24), phased array ADCPs, Imagenex pencil beam forward looking sonars, optical backscattering sensors, conductivity, temperature and pressure sensors. The REMUS 3000 is 14 inches in diameter and just over 12 feet in length. Constructed mostly of titanium, it weighs 760 pounds. The vehicle is outfitted with dual edgetech sidescan sonar with frequencies 120 kHz and 410 kHz and dual digital still cameras for accurate target location and identification. For clearer imaging, it contains high power LEDs with reflectors, variable pulse length which is spectrally matched to water. The vehicle's navigation capabilities include a Kearfott T-24 inertial navigation system coupled with GPS, and (LBL) Long Baseline Acoustic navigation for highly accurate bottom tracking/mapping and target detection. REMUS-3000 is also outfitted with a Neil Brown Conductivity/Temperature sensor, a Paroscientific Pressure Sensor and an Imagenex Pencil Beam Forward Looking Sonar. Like most of the REMUS AUVs, the 3000 communicates through Wi-fi, Ethernet, Iridium and ACOMMS (underwater acoustics). For safer launch and recovery, the 3000 has a descent weight dropper, ascent weight dropper and a recovery float/line release. 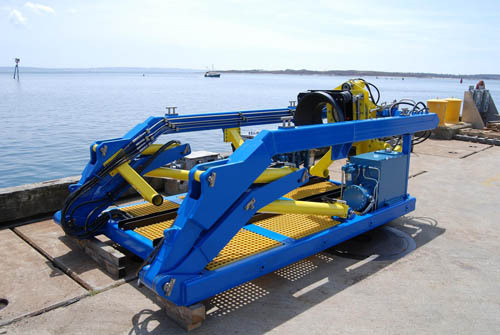 The REMUS-3000 Launch and Recovery system, similar to the proven system of our REMUS-6000 which has completed over 1000 successful launch and recoveries to date, has a footprint of 5.5' x 10'. The control consists of a tilt Aframe, tilt docking head, pay in/out winch and rotate vehicle. This system enables the launch and recovery system of the AUV to be simple, reliable, easy to operate and time-saving with the hydraulics operating at 10-15 HP with a built in joystick controls in a waterproof operators console. The system is vessel dependent and is mounted on the stern of a ship. It allows the vehicle to be operated from a vessel in sea states up to those generated by the Beaufort Scale 5 winds.